Why are Africans so tall? This article was first published in 2013. The content and structure in the current version do not yet cover all the key aspects we intend to cover. We plan to revise and extend the material in the future. Human height is determined by a combination of genetics and environmental factors making it an active area of research in both the sciences and social sciences. Recent breakthroughs in sequencing the human genome have allowed identification of 697 genetic variants that influence the height of an individual.1 Although genetics plays an important role in understanding variation within a given population, human growth can be limited by poor childhood nutrition and illness. 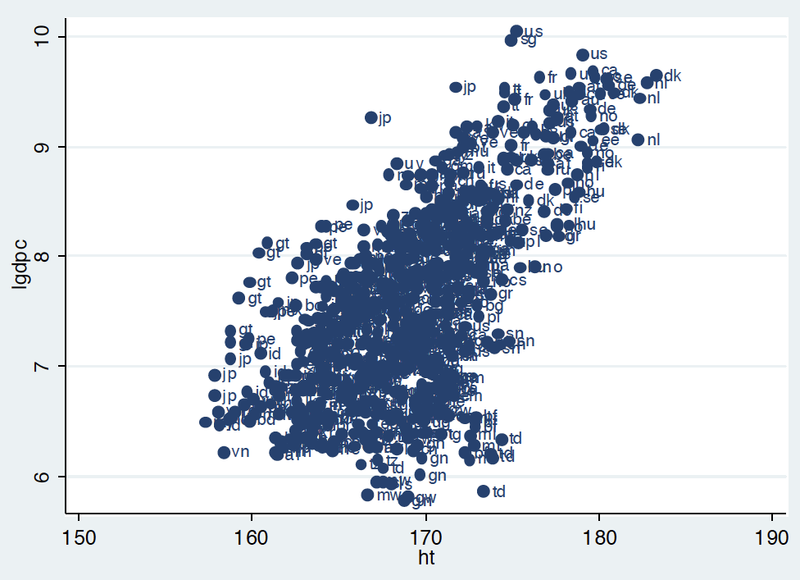 This makes height strongly correlated with living standards and hence a good proxy for them. 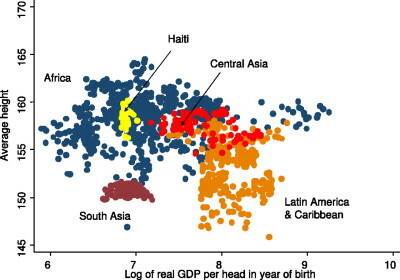 Changes to heights over time and within countries paints a picture of economic development. One major advantage of using height as a proxy is the availability of data in the pre-statistical period. It is important to stress that height is not used as a direct measure of well-being. In the absence of any abnormality or extremes, we should not expect that changing an individual’s height makes them any more or less happy all other things being equal. 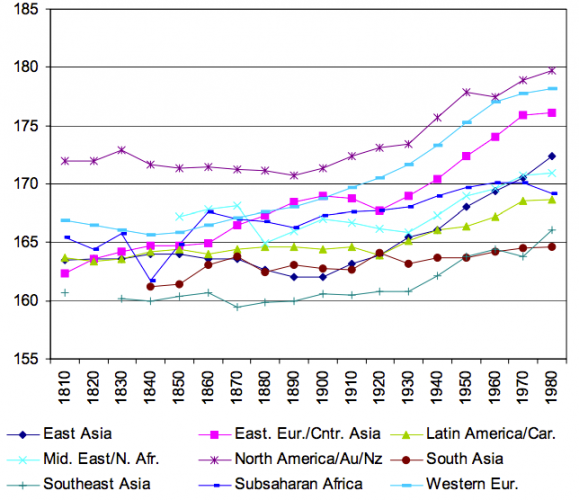 Human height has steadily increased over the past two centuries across the globe. This trend is in line with general improvements in health and nutrition during this period. Historical data on heights tends to come from soldiers (conscripts), convicted criminals, slaves and servants. It is for this reason much of the historical data focuses on men. Recent data on heights uses additional sources including surveys and medical records. In the chart below we see human heights in males and females in the Eastern Mediterranean region from the Upper Paleolithic (before 16,000 BC) through to the 20th century. 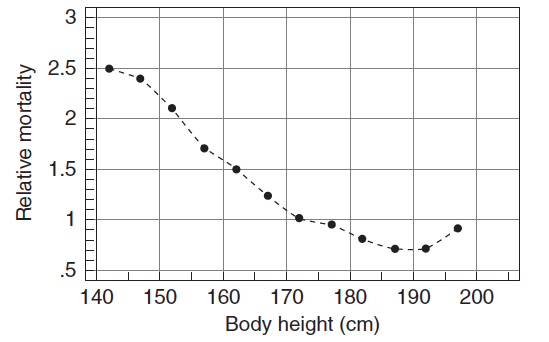 Over the last two millennia, human height, based off of skeletal remains, has stayed fairly steady, oscillating around 170cm. 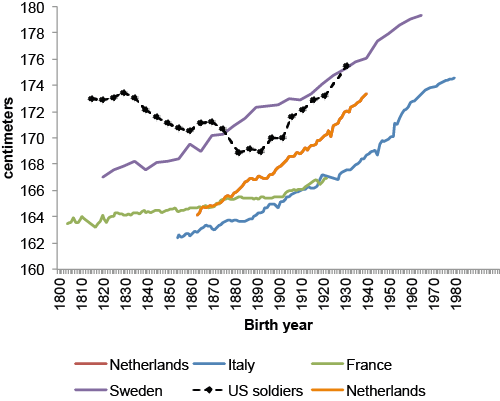 With the onset of modernity, we see a massive spike in heights in the developed world. It is worth noting that using skeletal remains is subject to measurement error with respect to the estimated height and time period. 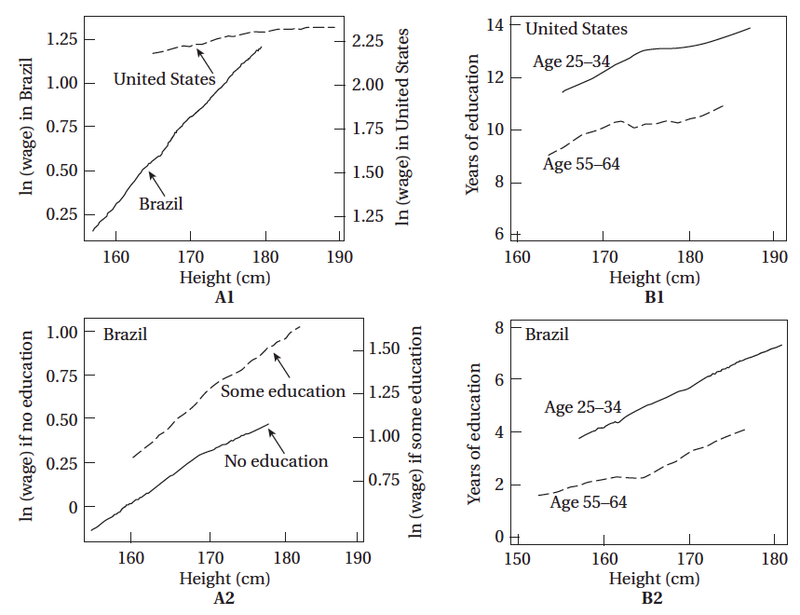 Though in general, human height has increased around the world, the following tables demonstrate that this trend is not universal. This first table shows the heights of men in modern foraging and subsistence societies. Many of these heights are lower than in the second table, which shows the heights of skeletal remains in various pre-modern periods. This would seem to indicate that human height is closely related to the lifestyle prevalent in a society, including the type of food consumed, the type of work undertaken, and the climate. Since height is used as a proxy for development, it should be strongly correlated with other indicators of development. The most common indicators of development are income, education and health. There appears to be a very strong positive correlation between income and height. We see here that wages and height are positively correlated in Brazil, with a much weaker correlation in the United States. There exists a similar relationship between education and height within both countries. Differences in the compulsory schooling age between the two countries may go some way to explaining the weaker relationship found in the United States. We see a decline in the relative mortality of men aged 40-59 as height increases, suggesting that taller individuals may be healthier than their shorter counterparts. When we exclude the richest countries from our sample we find that the positive correlation between income and height becomes negative. This result is due to Africans being significantly taller than their Asian and Latin American counterparts. Research by Deaton also finds a negative correlation exists for nutrition, risk of disease and women&apos;s education when comparing Africa to the same group of countries. While this may appear to indicate that the difference could be down to genetic factors, Deaton argues that this is unlikely to be the case since we do not observe any significant difference between the heights of Americans of Caucasian descent compared with Americans of African descent. Instead Deaton suggests it may be due to dietary differences and child mortality. Dietary differences (vegetarian diets in Asia) and the way each respective population has adapted to poverty could generate the observed results. Additionally, higher rates of child mortality in Africa cause the smallest and weakest children to die early before reaching maturity. Accurately measuring the height of an individual is a straightforward task and so we should be confident that there is relatively little measurement error in the recorded data. This is unlikely to be the case when measuring the height of skeletons. What is more, the techniques used to date skeletal remains (such as radio carbon dating) only provide a probabilistic estimate. Another factor to consider is the potential sample bias from the historical sources. Since the height data is largely composed of soldiers, criminals, salves and servants, these groups may not be representative of the wider population. This problem has been highlighted by academics researching human height.12 In fact, the observed drop in height during the industrial revolution -- usually attributed to the negative health impacts of industrialisation -- can be explained by the labour market conditions that existed at the time. They argue that "as economies grew, tight labour markets discouraged military enlistments by the most productive workers, with those enlisting (and being measured) increasingly over-representing the less advantaged members of society." Another issue is that there existed almost no systematic recording of women&apos;s heights meaning there is very little historical data on the heights of women. Time span: Some of the data goes as far back as the 17th century. Available at: It is online at the University of Tübingen here. The authors of this data are Jörg Baten, John Komlos, John Murray et al. The authors are Jörg Baten (University of Tuebingen) and Mathias Blum (Technical University Munich). In a study of over 250,000 individuals using genome-wide data, the study was able to identify 697 variants that determine an individuals height. The research was published in nature genetics and can be found here. Note by the authors: The country-specific estimates and their sources are available at the Tuebingen Height Data Hub and the Clio-Infra Central Data Hub. The data on human heights by world regions are unfortunately is unfortunately not available at these sources. The estimates of world-region trends for the entire 1810-1989 period are based on the population-weighted averages of 156 countries. The authors present two graphs in the cited paper. The first one (which is not shown) does not correct for the 'variations in the amount of reliable data available for each country in that region'. This graph shown here is based on data where the authors interpolated missing data relying on available observations from neighbouring countries. The source is Clark (2008) - A Farewell to Alms: A Brief Economic History of the World. Princeton University Press. Koepke, Nikola, and Joerg Baten. 2005. 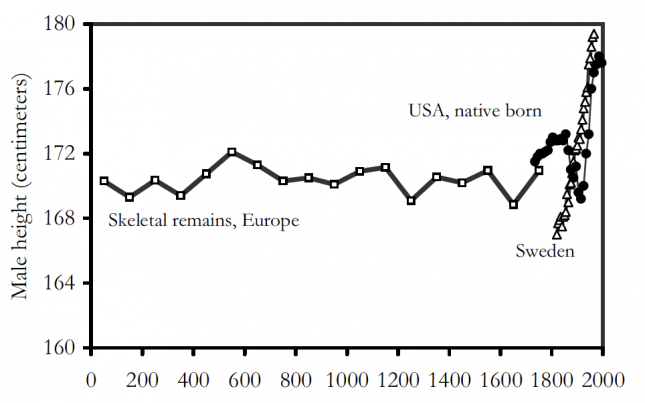 “The Biological Standard of Living in Europe during the Last Two Millennia.” European Review of Economic History 9(1): 61–95. A version of this paper is online here. Notes: *denotes heights adjusted to ages 21–40. The heights of all !Kung males averaged 2 centimeters less than those aged 21–40. Steckel, Richard H., and Joseph M. Prince. 2001. “Tallest in the World: Native Amer- icans of the Great Plains in the Nineteenth Century.” American Economic Review 91(1): 287–294. b Page 102 in Kelly, Robert L. 1995. The Foraging Spectrum: Diversity in Hunter-Gatherer Lifeways. Washington, D.C.: Smithsonian Institution Press. c Page 223 in Jenike, Mark R. 2001. “Nutritional Ecology: Diet, Physical Activity, and Body Size.” In Hunter-Gatherers: an Interdisciplinary Perspective, eds. Catherine Panter-Brick, Robert H. Layton, and Peter Rowley-Conwy. Cambridge, U.K.: Cambridge University Press, pp. 205–238. d Page 207 in Hawkes, Ernest William. 1916. “Skeletal Measurements and Observations of the Point Barrow Eskimo with Comparisons with Other Eskimo Groups.” American An- thropologist, New Series 18(2): 203–244. e Page 327 in Boaz, Franz. 1891. “Physical Characteristics of the Indians of the North Pacific Coast.” American Anthropologist 2(4): 321–328. f Page 69 in Trevor, J. C. 1947. “The Physical Characteristics of the Sandawe.” Journal of the Royal Anthropological Institute of Great Britain and Ireland 77(1): 61–78. g Page 751 in Boaz 1899. “Anthropometry of Shoshonean Tribes.” American Anthropologist New Series 1(4): 751–758. h Page 267 in Guppy, H. B. 1886. “On the Physical Characters of the Solomon Islanders.” Journal of the Anthropological Institute of Great Britain and Ireland 15: 266–285. i Page 172 in Truswell, A. Stewart, and John D. L. Hansen. 1976. “Medical Research among the !Kung.” In Kalahari Hunter-Gatherers, eds. Richard B. Lee and Irven DeVore. Cambridge, Mass. : Harvard University Press, pp. 166–194. j Pages 180–82 in Hurtado, A. Magdalena, and Kim R. Hill. 1987. “Early Dry Season Subsistence Ecol- ogy of Cuiva (Hiwi) Foragers of Venezuela.” Human Ecology 15(2): 163–187. a Page 133 in Meiklejohn, Christopher, and Marek Zvelebil. 1991. “Health Status of European Populations at the Agricultural Transition and the Implications for the Adoption of Farming.” In Health in Past Societies: Biocultural Interpretations of Human Skeletal Remains in Archaeological Contexts, eds. Helen Bush and Marek Zvelebil. British Archaeological Reports International Series 567. Oxford: Tempus Reparatum. b Pages 51–52 in Bennike, Pia. 1985. Paleopathology of Danish Skeletons. Copenhagen: Akademisk Forlag. c Steckel 2001. “Health and Nutrition in the PreIndustrial Era: Insights from a Millen- nium of Average Heights in Northern Europe.” Working Paper 8542. Cambridge, Mass. : National Bureau of Economic Research. d Masali, M. 1972. “Bone Size and Proportions as Revealed by Bone Measurements and Their Meaning in Environmental Adaptation.” Journal of Human Evolution 1: 187–197. e Mellink, Machteld J., and J. Lawrence Angel. 1970. “Excavations at Karatas-Semay U.K. and Elmali, Lycia, 1969.” American Journal of Archaeology 74(3): 245– 259.
f Angel, J. Lawrence. 1971. The People of Lerna: Analysis of a Prehistoric Aegean Popula- tion. Athens: American School of Classical Studies. g Pages 43–45 in Houghton, Philip. 1996. People of the Great Ocean: Aspects of the Human Biology of the Early Pacific. Cambridge, U.K.: Cambridge University Press. h Boix, Carles, and Frances Rosenbluth. 2004. “Bones of Contention: The Political Economy of Height Inequality.” Working Paper, University of Chicago, Department of Political Science. Table 6.
i Dutta, Pratap C. 1984. “Biological Anthropology of Bronze Age Harappans: New Perspectives.” In The People of South Asia: The Biological Anthropology of India, Pakistan, and Nepal, ed. John R. Lukacs. New York: Plenum Press, pp. 59–76. Source of data on GDP is Maddison (2001) – The World Economy: a Millennial Perspective. OECD: Paris. The source is Michael P. Todaro & Stephen C. Smith (2011) - Economic Development, 11th Edition. The Pearson Series in Economics. The original source is Strauss & Thomas (1998) “Health, nutrition, and economic development,” Journal of Economic Literature 36 (1998): 766–817. Note: ln (wage) stands for natural log of wage. This is taken from: Floud, Fogel, Harris, Chul Hong (2011) – The Changing Body Health, Nutrition, and Human Development in the Western World Since 1700. Cambridge University Press. The book's website is here. This is taken from Deaton (2007) and can be found here. The data used to produce this figure comes from the Demographic and Health Surveys (DHS) datasets and can be found here. Howard Bodenhorn, Timothy W. Guinnane, and Thomas Mroz. Biased samples yield biased results: What historical heights can teach us about past living standards. Vox CEPR Policy Portal (2015). Available online here.